We have almost been here two weeks and I (Maggie) feel like we have really settled in and are getting into a fun routine. Our first full week flew by in a blur of construction, tea (‘chai’ in Swahili), mud, manure, and laughs. On Monday we started fixing our first stalls for the welfare project. Most of the cattle here have pens/sheds that consist of a stall for lying in, a milking stall, an alleyway, and a feeding area. Last year, the farms were divided into treatment and control groups. The treatment farms had their stalls fixed and the control groups were given Calliandra seedlings. This tree grows well in this region and has a very high protein content. When fed in abundance, Calliandra can be used to supplement or replace expensive feeds like dairy meal. Though most farms are quite small and there isn’t much room to grow more crops, Calliandra can be grown in place of the decorative hedges found at the perimeter of farms. Aesthetically pleasing and functional! This year, we are doing the opposite with the groups; we are fixing the stalls of the control groups and bringing Calliandra to the treatment groups. On Monday, our construction skills were put to good use on the first control farm. 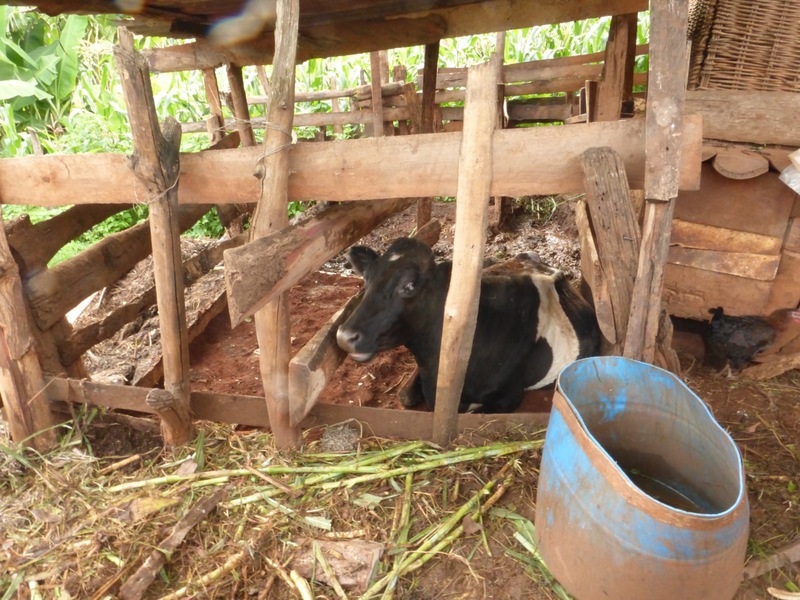 The cow on this farm, Meni, has eye problems and is completely blind. Her pen had no stall and the only area for her to lie down consisted of deep mud and manure. Within a few hours, we made her a roof-covered, comfortable stall. When we returned an hour later, we found Meni lying down in her stall and looking so comfortable! It was pretty incredible to see such instantaneous results and definitely worth the hard work! It’s also been really satisfying to go to farms that had their stalls fixed last year and seeing them being well-maintained and used by the cows. 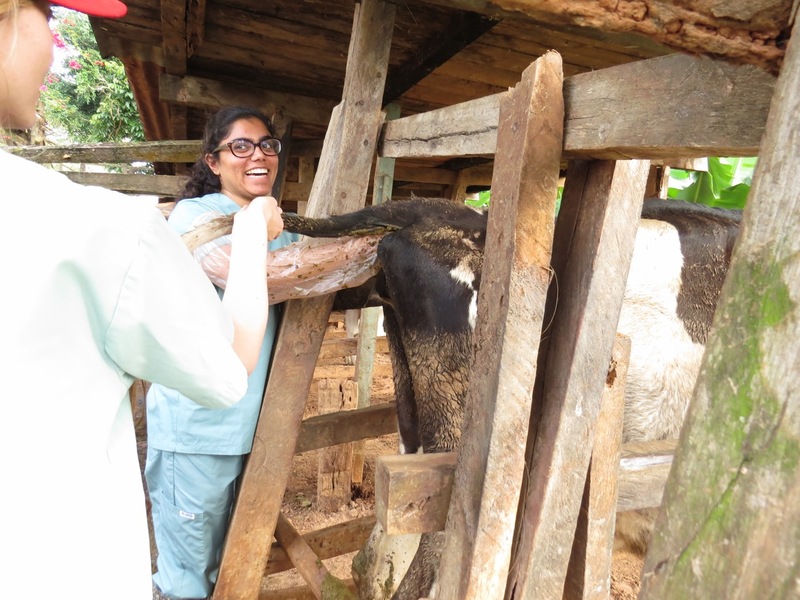 In addition to the physical exams and mastitis testing/treating, we interns are getting lots of practice with other clinical skills. 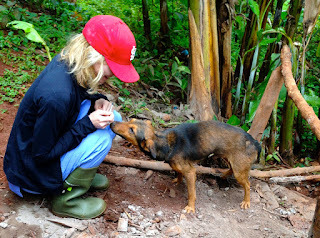 On our second visit to the farms, we treat all the cows and any cats or dogs on the farm for parasites (mites, fleas, ticks, worms, etc.). We are also checking the pregnancy status of many cows; this skill is critical (although perhaps not glamorous!) for any bovine practitioner. In addition to being good practice for us, it’s also great to be able to tell farmers that their cow is indeed pregnant, since they are counting on her to make milk (which requires having a calf). On Wednesday, we had a break from farm visits and went to Ithanji primary school, which is a local school that is twinned with an elementary school in Prince Edward Island through Farmers Helping Farmers. We had a very successful meeting with the head teacher about the possibility of us teaching some of the classes later on in the summer. We also got a tour of the school, which has really benefitted from being twinned with the PEI school. Every year, Farmers Helping Farmers holds a barbecue in order to raise funds for a cookhouse for one of their twinned schools, and Ithanji is one of these schools. 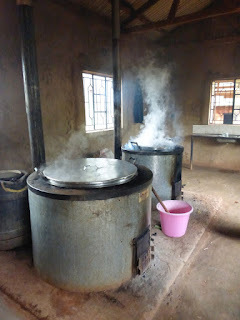 The cookhouse allows the school to have a lunch program for their students, and there was porridge and githiri (maize and beans) cooking away when we stopped by. The ingredients for the lunch program come from the school’s farm as well as from donations by parents. In addition to the cookhouse, the school has received many rainwater tanks, new toilets, a hand-washing station, doors, and windows from the PEI twinned schools. Later that day, we also went for a tour of the Bora Feeds factory; this local company makes feeds for many different animals, and is one of the main providers of dairy meal in the region. It was really neat to see the whole process from the raw ingredients (fish meal, wheat bran, sunflower seed cake, etc.) to the grinding, mixing, and packaging. We are having a great time working with and getting to know our Kenyan coworkers Priscilla and Ephraim. In addition to being our translator and driver, they have also quickly become good friends who put our construction skills to shame, introduce us to new music, and patiently answer our never-ending questions. We all had a good laugh one day when Mira learned (the hard way!) that the Swahili word for hammer, ‘nyundo’, closely resembles ‘nyondo’, the Kikuyu word for breast! Working with the farmers has also been really fun and rewarding. We find them to be very enthusiastic and open to new ideas. In addition, their generosity is incredible. We have been here less than two full weeks and have already been served multiple meals (often cooked for the household and then given to us instead), and commonly sent on our way with bunches of fresh fruit. Many people, myself included, tend to have a picture in mind when hearing the word ‘poverty’, of people living in grim conditions, hungry, and in need of aid. However, working with people who are considered to live in impoverished conditions and seeing their constant smiles, positive attitudes, and unselfishness makes you realize that common portrayals of poverty in the media are not always consistent with real life experiences and that the face of poverty can vary quite dramatically. Yes, they are still very poor compared to Canadians, but they are happy because they have food from their farm, water from nearby sources, and family around them - the essentials. Their happiness, despite having little money, savings or material goods, helps us put our lives in Canada into perspective. Meni was so excited to lie down she couldn’t even wait for the shavings! Only a vet student could be this happy about pregnancy checking via rectal palpation!